Depressed, that’s all I need to say. 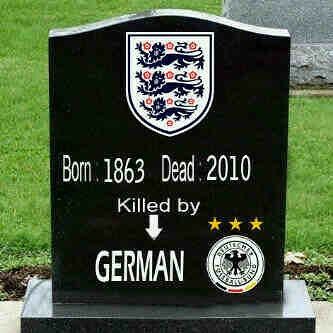 RIP England, just another 4 years of shame before we get embarrassed again in Brazil 2014. I would have liked to have seen an Argentina vs Germany final, but it’s coming up next game – that’s gonna be one hell of a match. #BRA vs #ARG final anyone? I think semi-finals will be Uruguay vs Brazil (too easy for Brazil?) and Argentina vs Portugal. Completely outclassed man, was hoping for a strong come back but the English team looked so sluggish. ..that’s assuming they qualify to get to Brazil in the first place. it’s ok..david beckham’s looks make up for everything. Brilliant pic lol, cant stop laughing 😀 . As for being outclassed, who knows what would happen if they came back from 0:2 to 2:2. Its not easy to play when you think all the time about how you got robbed. Mark Leo: They just looked poor since the start. Simon Seow: I hope so, but honestly I don’t see any yet. Suertes: Haha they’ll manage to qualify somehow, but after that….who knows. aud: Hahah the girls love him. 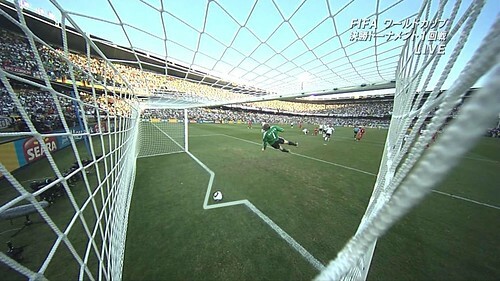 lightyoruichi: That’s a succinct summary of England’s performance. michaelooi: Well seen as they are both out, boo to that LOL. Looks like it might be a Euro battle, #ESP vs #GER. Myhorng: Bring on the Eagle Eye! ciki: Pffft, oh well what to do? Selina: Yah, big psychological disadvantage and #ENG team is massively emo. Selina: *sigh* yah – poor Andy.